This one post will be the exception to all of that. I was recently asked if I would be willing to be “grilled” by Grandma Lisa over at Grandma’s Briefs. Lisa has a wonderful Grandma blog — and she is very young to be such a wise Grandma! Grilling means to answer a bunch of questions about how much fun it is to be a Grandma. It was a great interview. If you get a chance, I hope you will read it. You can find my interview here. And if you ended up here today because of Lisa’s blog let me tell you a little bit about Life in AmaraLand. 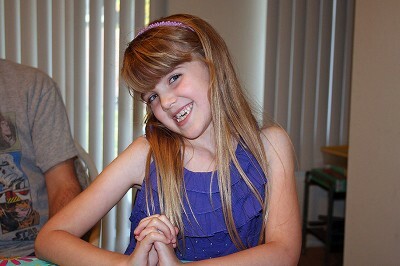 Amara is our only and very awesome granddaughter. She will be 7 next month and will celebrate that event in our backyard, which we also call AmaraLand. We live in sunny southern California and are lucky enough to be only 1 mile from Amara’s house. She spends lots of time with us and Grampy and I know how truly lucky we are to get to be such a huge part of her life. If this is your first time here I would like to suggest one of my favorite posts, about the day Amara turned blue! — kidding. You’ll get a good idea of how much fun we have here at AmaraLand. And if you want to know more about why it’s named AmaraLand, read the About page. This memory was posted in Grandparents, Special Occasions and tagged Amara, AmaraLand, backyard, blog, Grandma, Grandma Kc, Grandma's Briefs, grilled, interview on March 23, 2011 by Grandma Kc. You were a pleasure to grill! I’m so pleased you enjoyed it. I hope Amara gets a kick out of having her blog and her marvelous Grandma in the spotlight! This might be when I first met you. I always enjoy your posts. It’s so much fun to watch Amara grow up. Y’all seem to really have the most fun! I love your blog, your granddaughter, you! You always make me smile and make me thankful you’re my friend (even tho we’ve never met in person). Thank you for linking to the GRAND Social!